Cheese is a delicious and nutrient packed food that is rich in protein, calcium, vitamin B12 and selenium. It comes in a wide range of varieties, some of which include feta, mozzarella, ricotta and cottage cheese. If you are watching your weight, you may be wondering whether you should include cheese in your diet. The short answer is yes, you can still continue eating cheese, but should do so in moderation. In its simplest form, weight management can be summed up by a short equation: calories in – calories out. The first number represents the energy that you introduce into your body via the food that you eat. The second number represents the energy that you burn naturally throughout the day, and when you exercise. If the result of this equation is a positive number, it means that you are consuming more calories than you are burning, also known as a caloric surplus. The excess calories that you consume are stored as fat around the body and this is what makes you gain weight over time. The number of calories that an individual should aim to consume will depend on their gender, age, height, weight, activity levels and overall goals. Because of this, two people can have very different calorie requirements. You can use the tool below to calculate an estimate of the number of calories that you should be consuming. For example, a 40 year old lady who weighs 75 kg (165 lb), is 170 cm tall and exercises 4 times a week should aim to consume approximately 2250 calories to maintain her weight and 1800 calories to lose weight. The amount of calories in foods differs, depending on what they are made up of. Those that are mainly made up of water tend to be low in calories and those that have a lot of fat tend to be high in calories. The amount of fat in cheeses varies greatly and so does the number of calories that they have. For example, 100 g of cheddar cheese has 33 g of fat and 403 calories. However 100 g of cottage cheese only has 4 g of fat and 98 calories. Below is the nutritional information for various types of cheese, per 100 g.
The type of milk used to prepare a cheese affects the fat and calorie content. 100 g of ricotta made from whole milk has 174 calories whereas 100 g of ricotta made from skim milk has 138 calories. Generally speaking, most cheeses tend to be fairly high in calories. What this means is that they should be eaten in moderate amounts. You can even eat cheese everyday if you want to, but in order for it not to affect your weight, portions have to be controlled. If the lady in the example above were to follow an 1800 calorie diet and include a wedge of feta cheese (100 calories) in her diet everyday, it would account for roughly 5% of her total daily calorie intake, which is perfectly fine. If however she were to eat 2 cups everyday, this would account for 45% of her daily calories. This combined with all of her other meals means that she would most likely consume too many calories and end up gaining weight. Another important point to note is that cheese tends to be high in sodium. Consuming too much sodium can negatively affect blood pressure and lead to water retention. Whilst water weight is different from gaining fat, it can make you look bloated and will show up when you step on the scale. This is another reason why the over consumption of cheese is not a good idea. So the bottom line is to continue enjoying your cheese, but not to overindulge. Can eating cheese be beneficial for weight loss? As you can see from the nutritional information of the various cheeses above, they are rich in protein. Protein has a high satiety, meaning it helps to fill you up. Indeed, numerous studies have found that eating a protein rich diet can assist with weight loss because it satisfies appetite and increases energy expenditure slightly. This means that the consumption of cheese can assist with weight management. This is especially true for cheeses that don’t have too many calories but have a high protein content. A good example is cottage cheese; a one cup (210 g) serving has 207 calories and 23 g of protein. For this reason, many weight loss diets often include cottage cheese. This study involved 60 adults who included protein rich foods like cottage cheese in their diets. After one year, the diet helped decrease body weight by an average of 2.8 kg in women and 1.4 kg in men. 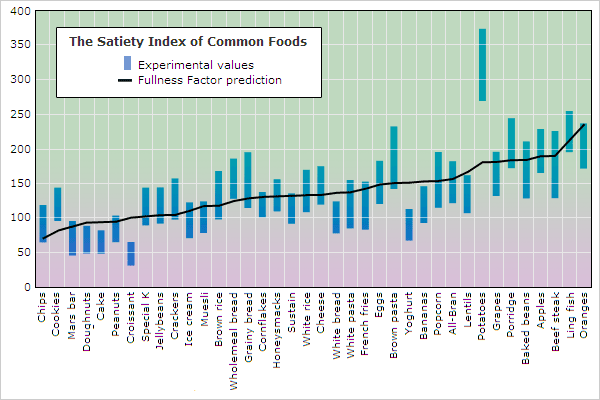 And this study found that cottage cheese has a similar level of satiety to eggs, and as you will see in this graph, eggs rank pretty well. As mentioned previously, not all cheeses are created equal. When choosing cheeses for weight loss, read nutrition labels and opt for ones that are high in protein but do not contain too many calories. Cheese does not have to be fattening, so long as portion sizes are controlled. Consuming certain types of cheese can actually be beneficial for weight loss.